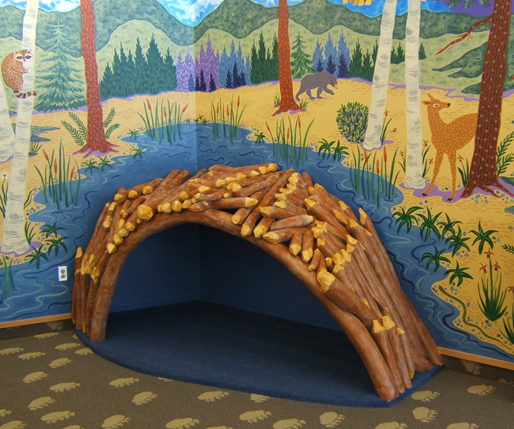 A private grant to the Coeur d'Alene Public Library made possible this beaver lodge and companion mural of a dreamlike forest with wildlife. Allen and Mary Dee created this piece for children to enjoy while reading beneath the sticks and logs of the lodge. The mural is approximately fifty feet in length and about nine feet tall. The lodge is constructed of pine and fir, carved and painted to coordinate with the mural.